There are so many publications out there on the subject of web design and development that it’s hard for a budding designer to know what to read first. With that in mind, we’ll be looking at some of the most useful out there — out ‘Desert Island Collection’ — over the coming weeks to help you to choose books that are right for you. First up, a true classic: Steve Krug’s Don’t Make Me Think, a book which, though written in 2000, and revised twice, somehow remains highly relevant to today’s design landscape. At the time it was written, web usability — which is what the book is concerned with — wasn’t even considered a legitimate field of its own. Fifteen years later, UX is an industry, yet somehow every one of the tips contained in this book remain extremely useful and pertinent to beginner and even experienced designers alike. Compare it with any HTML book from the same era (pitching the virtues of table layout), and you’ll realize what an amazing accomplishment that is. I guess it proves that technology may change, but true common sense never goes out of fashion. 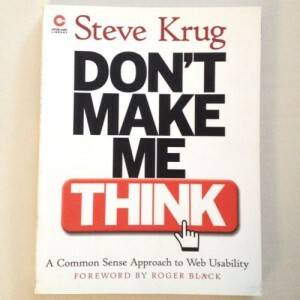 The book’s title gives a very good clue as to its contents; as Steve points out, the first law of usability is that the user shouldn’t have to think about anything when they land on your website for the first time. This relates to all aspects of the design, from the positioning of the logo and links, to the content and the way that it’s written. So, what are the question marks? Well, these are the things that people think about when they arrive at the site that they really shouldn’t have to. So when designing, it’s your job to ensure that everything on the page is immediately obvious to the user, they don’t have to think about where they need to click as they are already being subtly directed there. This is the entire principle of the book and of usability itself, or UX (User Experience) as it’s more commonly known today. On reading, the first thing that you’ll notice is that many of the example sites that Steve uses are now completely out-of-date … but it doesn’t matter, because all of the things discussed with regard to the sites are not. In the opening chapters, one interesting thing that I noted was that Steve gives an example of a flat button, which can make the user think it’s not a button. This is intriguing in view of the recent trend towards flat design. The book suggests that a flat button will make the user question it, even if it’s just for a millisecond. With this in mind, this is something that perhaps bears thinking about when designing towards a fad or current trend; just because it’s popular, it doesn’t necessarily mean that it’s correct, or even good. I was thinking about this in relation to the recent move towards minimalism in design too. A site that is bare bones can reveal no navigation and make it confusing for the user, so if you are designing using these trends, it bears thinking hard about the user during the planning process. Don’t get me wrong, there are some beautiful minimalist sites around that are easy to use and have been well-crafted, but if you’re a beginner, then it’s vital that you understand how the user will see it and of course, use it. This is because, as Steve points out, even if it’s obvious to you where you should click, users don’t want to have to puzzle it out. They like the steps to be immediately apparent when they have come to the site for something and they don’t want to have to hunt too hard for what they need. Your job is to direct them and if you don’t know where to start, then I would strongly suggest that you get hold of a copy of Don’t Make Me Think as it’s packed with actionable tips and advice. This book is ideal for beginners because it doesn’t dive into anything overly confusing but is written in clear, simple language that is also peppered with humor. It’s highly accessible thanks to the conversational tone that the author takes and there’s absolutely nothing intimidating about it. This will be refreshing for many newbies, as there are plenty of books on the market that make you want to run for the hills and wonder why you ever wanted to be a designer in the first place. The actual Average User is kept in a hermetically sealed vault at the International Bureau of Standards in Geneva. We’ll get around to the best way to think about the “average user” eventually. Oh yeah? Here we are fourteen years following the first release of the book and we still bang on about the average user. This made me giggle I have to say and is a good example of what an easy and accessible read the whole book is. Let’s face it, we might all love learning, but anything that can do it and put a smile on our chops has to be a good thing. The book is twelve chapters long, around 200 pages, with a list of recommended reading at the back. It’s a breezy and fun read. 2: How we really use the web looks at how people scan a page when they arrive at it and the human ability to muddle through, rather than take a logical approach. Whilst some of the references in this book may hint at its birth era — Steve talks about some people thinking that Yahoo! actually is the internet (Google occupies that role for many today) — it’s stood the test of time incredibly well because it is so very useful. Taking you through the basics on every aspect of UX for beginners, this is a great starting point for those who may feel a little bewildered by the discipline. You can give it a read through very quickly, it’s easy to understand and won’t blind you with overly technical terms and science. You can then refer to the book again and again when starting on any site. The internet has become an integral part of our lives, much more so than when Don’t Make Me Think was first written and printed. Technology has raced along at a dizzying pace and we now access the web on smartphones, tablets and even our televisions. However, one thing hasn’t changed very much at all and that’s how users perceive the sites that we build and how they make decisions based on those perceptions. Websites that allow the user to gain value and find what they want without any fuss, or without making them think, are the ones which will be the most successful. UX is all about giving the user value and a good experience when they interact with our designs. Whilst it’s tempting to dive in and create something that you think is a work of art, if the user can’t find their way around, if there’s no search function, or if the navigation is not logical, then it’s likely that you’ll be one of a handful of people that visit it. There’s a lot been written about UX since this book was penned, it’s a discipline that’s risen hugely in popularity in recent years. However, it doesn’t have to be something that you study in depth in order to be able to get it right, just read this book and you have an excellent starting point. I found the usability testing chapter very interesting and useful, and reading the book again has given me that strange urge that makes me want to go out and study as many websites as possible (especially Amazon, which Steve uses liberally as examples). I also found the chapter on writing copy very interesting, not least because it’s something that I have a vested interest in myself. Many people, even great designers, make the mistake of using too many words, or worse, really convoluted words which will just alienate the user. Bearing this in mind, it’s great to see something which essentially teaches you the basics when it comes to web copy and the effect it has on users. You don’t have to be a UX consultant or expert like Steve is in order to understand usability, nor do you have to become one. Following such basic principles as those set out in Don’t Make Me Think will stand you in good stead when it comes to creating sites that users will love for many years into the future.